* the penultimate /g/ is a misreading of the original /dj/. † this should be wañkcίgo’ιⁿṇérεgi, but the /o/ was accidentally omitted with the change of lines in the middle of the word. ‡ CW 69.1a has wą́kcíkʔį̀regi. * in Winn. III.1.11, there are two instances of [γ] written in succession. égi hižą́ t’éže. T’éga nįkjǫ́gᵋra* nųpíwi gixetéregają, égi t’éže. then one he died. The one who died the children two they were grown up, then he died. * CW 69.3a has, nįkdją́́k.ra. * after this word is written, kenēní. * < e-haji-ire-s’a-že. The accents are those given in CW 69.5b. *CW 69.8a has in error, tciną́k.re. * this reading is followed in CW 69.8a, but is based on misreading the  of the first line as a [γ], which in Radin's handwritting are almost identical. hidánιñk‘ε ë́dja minάⁿgεnαⁿkcε Gigấhiga εwidáni, ä́gi wagaírejε. hitánįke éja miną́gᵋną̀kše. Gigóhiga† ewitáni égi wagaíreže. three of them there they sat down. He that called her he made three and they spoke to her. * this is preceded by hidjo. † following the reading at CW 69.10a. tcowë́djanαⁿk‘a hok‘it’ádjirejε wagεjέ, "Wocgốⁿṇa hik’anấṇa hik‘arap‘érεz." Čowéjanąka hokit’ájireže, wagežé, "Wošgǫ́na† hikanána‡ hikarapérezᵋre,"
The foremost he began to speak to her, he said to her, "The affair your husband know of it for yourself." * two parallel lines (||) are inserted before this word. † CW 69.11a has, wocgą́ra. ‡ CW 69.11a has, hikó‧nora. ‡‡ a small /r/ is written above the /d/ in the original hikarapérêzdê. * omitted from Winn. II.5.26. † on Winn. 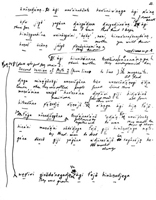 II.5.26, hoit’έ hojεdjaíⁿdja, wagεjέ "Rohíra hok‘ιⁿmίⁿcdjε" is typed at the top of the page with instructions to insert it here. ‡ dê is omitted from Winn. III.1.12. ‡‡ this sentence is omitted from CW 69.12a/13a. * CW 60.13a has, hidánike. † this follows the reading of CW 60.13a. rohíra hókįmįžìkje higaíreže, giži. * Hąké hiwa’ų́irą‡ t’ąp‡‡ kírikaranìže. the body she should lay down they told her [.] Not angry she got up she did. * for higaíreže, giži., CW 69.14a has, higáiregi‧giji. † hiwa is written in small letters above a syllable that has been crossed out. ‡ this follows the reading of CW 69.15a. ‡‡ CW 69.15a has, tʔap. * wawagê [ϕ] yapérêzᴇiñkdjegế [λ´]gadjáⁿ άnañga is inserted here in Winn. 3.1.12 from the bottom of the page by an arrow. ‡ CW 69.16a has, haixó xdjį. wakuruhį́č hakiriánąga égi aruxémanigų́gi ǧágᵋra hiwa-ą́že. greeting she passed them and turning her back, she went out. The crying she started up. * the final /έ/ (originally /ế/) is a copying error. * the -re- of subsequent versions of the text is omitted in the original. † CW 69.19a has, wawogiràcge, which may be a metathesis error. The form wawogirákše is well attested and is consistent with the meaning suggested by the context. higaírega. "Naní, hirak‘arap‘erεzdε; hιñk‘écαnαⁿ jë́sgε hip‘erεz hiranínαⁿ. higaírega. "Naní, hírakarapèrezte;† hįkéšaną žésge hiperes‡‡ hiraníną. they had said. "Mother, you will know something; not anything that kind to know they do not. * the initial /h/ has been lost through external sandhi. † following the reading of CW 69.20a. ‡ written at the bottom of the page and connected to this phrase by a line is: "they're not the only people who know of the Lodge" (where "Lodge" is a reference to the Medicine Rite). ‡‡ following the reading of CW 69.20a. Assuredly you shall know of these things." * connected to this word with a line from below is: "a particle expressing defiance" (with reference to tcako). 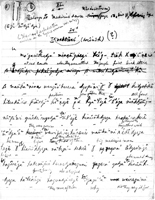 For the original handwritten phonetic text, see Paul Radin, Winnebago Notebooks (Philadelphia: American Philosophical Society Library, n.d.) Winnebago III, #1: 11-13. 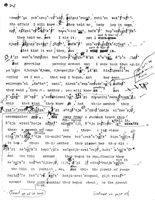 A typed interlinear text is found in Winnebago II, #5: 24-25, 29. For a typewritten phonetic text (without diacritical marks), see Winnebago III, #12: 14-15. A phonetic handwritten text with interlinear is found at Winnebago II, #1: 23-25. A text with an English translation is found in Paul Radin, The Culture of the Winnebago: As Defined by Themselves, International Journal of American Linguistics, Memoirs, 3 (1950): 69.1a-21a, 74-75.1a-21a (English). A loose English translation is to be found in Paul Radin, The Road of Life and Death: A Ritual Drama of the American Indians. Bollingen Series V (Princeton: Princeton University Press, 1973 ) 91.